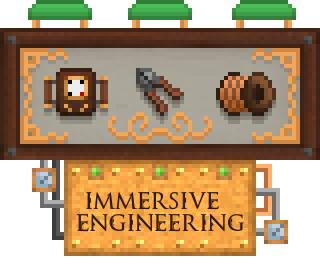 Immersive Engineering is a tech mod with a certain charm, based on the ideas and concepts, and with most assets created by Damien Hazard. IE is about making tech mods more balanced and more pretty, and adding its own twist by going for retro-futurism (think BioShock, Order 1886, SkyCaptain and the World of Tomorrow) rather than clinical white+grey future cubes. It uses the RedstoneFlux API, known from RF Tools, BuildCraft, EnderIO and many other mods, but can be played fully standalone. Unlike other mods, IE does not use powertransfer via lanes of blocks, but instead via cables spanned between connectors. For all your documentation needs, you should look into this mods ingame documentation, the Engineer's Manual, crafted with a book and a lever. I am creating terrain for a custom map and want to spawn Immersive Engineering ores in through World Painter, but to do that I need the Block IDs of all the ores and their spawning data (frequency, cluster sizes & height ranges). Is there somewhere I can get this data? If not, could you post it? Thanks! Hi. is it true that placing a lot of garden cloche's in a chunk cause tick loss? I had major tick loss near my base and my friend destroyed my IE setup using 60 cloches divided over 2 chunks. he blamed it on them. it's true? There's recipe for insulated wires. Pretty sure it just uses hemp fabric. Do you use JEI to see recipes? In case you're not using JEI (which BluSunrize already suggested), I found the recipes in the manual - Basic Wiring, page 2, though you might need to click the triangles/arrows to the left or right of whatever recipe is shown there to find the recipes for insulated wires. Hemp Fabric? Yes.. Looking (Sounds of papers shuffling for comedic effect), Basic Wiring? Yes.. (More paper shuffling). Well, I'll be damned, looking at the Recipes for Tough Fabric they're right there. LV and MV insulated wires. Hm, no HV? -talking to self- Then again, I suppose HV is more of a means to transport power across distances, rather than from my ceiling to my machine..
is this compatible with mekanism? Why are there iron nuggets in this mod? I've read the github issue, and it is totally possible to just replace the texture without adding the duplicate of an item. Also it would be fantastic to have configs to individually disable the mods features(blocks, items etc) like quark and some other mods do. Otherwise it is a fantastic mod, especially the aesthetics of this mod is at a very high level. Iron Nuggets are legacy. They are in because vanilla didn't use to have them. And me personally, I dislike replacing vanilla things with a mod, which is why I didn't. Configs to disable an entire feature are not as easy as it sounds, would basically have to rewrite the entire mod. Plus, unlike Quark, IE is supposed to be enjoyed in its entirety, with all of its content. Will the iron nuggets be removed? I couldn't really tell from this response, sorry. The other part is totally understandable, but the iron nugget... somebody would just call it straight up bloat(not me, of course, some people may). hello,when we can play the verions of 1.13? One last thing, I am way sorry you guys have to deal with the public, probably including me. At least mine isn't a question that if people would simply take 3 seconds googling, they could get the answer. Darwin is no longer on active duty and has been temporally placed on paid leave. I'm sorry to tell you, buddy, but that feature has never existed. Posts have always had opposing arms, due to the fact that Hazard's original model for them only had two arms, which opposed eachother. There's never been the option to to 90° so there is nothing to "put back in".